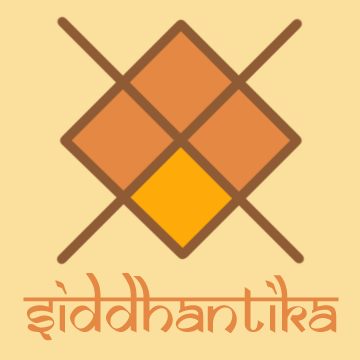 This document explains your rights and obligations on the siddhantika.com website. We have tried to make it as short and readable as possible, but please read it carefully because you are bound by its content when using this website. The siddhantika.com website contains a lot of information (including pictures). We created most of it ourselves, while other information are derived from innumerous books, essays, and articles. Although we carefully draft the information we publish and we try to correct any mistakes as soon as possible, you should be aware that you use any of the information on this website at your own risk. You should be even more careful when using the visitor-contributed information like the comments of our posts. This means that - to the furthest extent permissible by law - we are not 'contractually' or 'extracontractually' responsible, in any way, for any harm this website (or any external website we link to) might cause you - unless, of course, we publish information that is intentionally fraudulent or harmful information, which is unlikely! When you participate in comment discussions attached to posts and pages, you are responsible for what you post. Although we will not screen all contributed content, we reserve the right to remove anything we deem inappropriate, without any possibility of recourse or redress on your part. Be aware that some users will rely on the content of your posts. You - and not siddhantika.com - are responsible for your posts, and you hereby fully indemnify us from any claim we might receive from third parties harmed by your content. We take privacy seriously. When you visit our website, our servers collect some technical information about you (web browser type, IP address) and also track which pages you visit on our site, for a period of up to 24 months. As long as you are not logged in, this information is fairly anonymous and we will use it only to create anonymous statistics (which we may sell to third parties). We may also provide the information collected about you if, in cases of fraud or other criminal activities, we are subpoenaed to do so by competent legal authorities. If you post to our website, you will, of course, leave some additional traces of your identity: contact details, log in, etc. However, unless we are legally forced to do so, we will not combine our server logs to create detailed tracking of your behavior or sessions on our website. This website uses several cookies. They store technical information that allows us to better interact with your browser and to identify you on subsequent visits to our site. Additionally, third parties may be placing and reading cookies on our users' browsers, or using web beacons to collect information as a result of ad serving on this website. Google's use of the DoubleClick cookie enables it and its partners to serve ads to our users based on their visit to our sites and/or other sites on the Internet. This website also uses 'Google Analytics' and 'Google Webmasters' to collect non-identifying and aggregate information to improve our website. Our company is located in Kolkata, India. We will handle your personal data in accordance with the strict requirements of Indian data protection and privacy laws. Any claim, lawsuit, discussion, or similar concerning this document or your use of this website is under the jurisdiction of India, and will be addressed in court in Kolkata, India.